Businesses and individuals can use noqodi platform to make e-payments for various government services. Emirates Islamic, one of the leading Islamic financial institutions in the UAE, has partnered with emaratech, a leading online technology solutions and consulting company in the Arab World, to enable individuals and businesses to make electronic payments for a range of government services via the noqodi payment gateway. 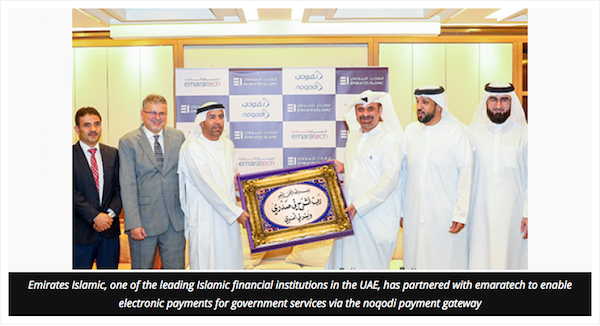 Through the new tie-up, Emirates Islamic’s individual and corporate clients can top up their noqodi wallets and make eVoucher payments through various channels such as the bank’s smartBUSINESS platform, mobile app and online banking, and ATM machines. This will enable customers to seamlessly make online payments for services offered by government departments including Dubai Land Department, General Directorate of Residency and Foreign Affairs, Fujairah Municipality and more. Salah Mohammed Amin, CEO of Emirates Islamic, said: “As one of the leading Islamic financial institutions in the UAE, Emirates Islamic is a keen supporter of Dubai’s vision of transitioning to digital payment methods, as it seeks to become a Smart City. Thani Alzaffin, General Director and Board Member of emaratech, said: “While the Dubai government is going smart in digitalising payment methods, noqodi has partnered with Emirates Islamic to support the UAE strategy moving towards a cashless economy. With just a few easy steps, Emirates Islamic individual and corporate clients will now be able to register and top up their noqodi wallet on all Emirates Islamic channels such as smartBUSINESS, mobile banking, online banking and ATMs. As part of its ongoing digitisation efforts, Emirates Islamic has made significant investments in innovative, technology-driven solutions to offer enhanced capabilities and greater convenience to clients. The bank was named ‘Best Islamic Banking Brand’ by Global Brands Magazine and recognised as ‘Best Islamic Bank’ in the UAE by Global Finance. Emirates Islamic was also recognised for its range of innovative products at the Banker Middle East Product Awards 2018, winning ‘Best Islamic Card’ and ‘Best Mobile Banking App’.